Community health services are provided in local areas, outside hospital. They work alongside general practices to help people stay well and independent in the community. The NHS and partners want to keep community services strong. 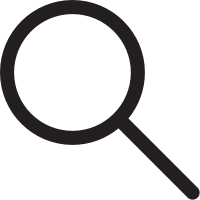 We are currently seeking a single community services provider for Bristol, North Somerset and South Gloucestershire. Between October and December 2018, hundreds of local people, patients, carers, healthcare professionals, local authorities and voluntary and community groups had their say and helped us to understand what is most important to them. People shared their views in workshops and through a survey. Healthwatch helped the CCG to engage people and support planning future services. 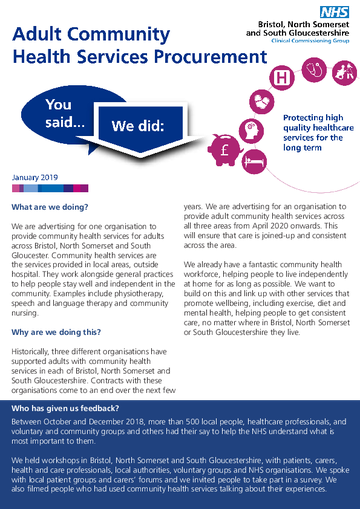 This report summarises feedback we received during our engagement activities for the adult community health services procurement in Bristol, North Somerset and South Gloucestershire and what we have done as a result. 196 people completed our survey asking about community health services, including members of the public, patients and carers. This summary provides themes in people’s feedback from a service specification development workshop in Weston Super Mare on the 18 October 2018. This summary provides themes in people’s feedback from a service specification development workshop in South Gloucestershire on 1 November 2018. This summary provides themes in people’s feedback from a service specification development workshop in in Bristol on 1 November 2018. 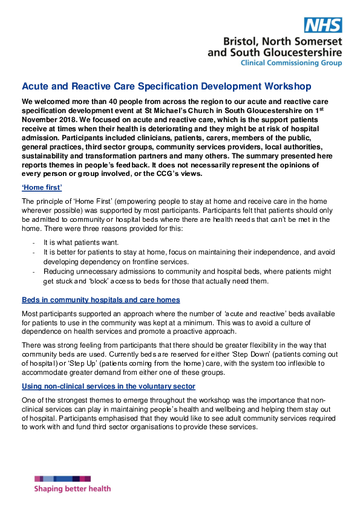 This summary provides themes in people’s feedback at the Carer's Rights Day workshop held at the Vassal Centre on the 30 November 2018. This summary provides themes in people’s feedback from the engagement workshop held in Bristol on 19 November 2018. From 2020, we aim to make sure that community healthcare services for adults are more consistent and joined up. We are seeking a single provider of local community services to ensure that you get consistency, fairness and quality from community services whenever you need them.